The Swing Cats are the coolest wedding and event band. We not only perform as a 6 piece band, but also as a 3 piece entertainment act for drinks reception or for any type of events. Get in touch with us for quotes and availability!. We had a great time performing for an amazing crowd at the Mansion House.The Swing Cats had the pleasure to be part of the Trinity College Graduation on friday. 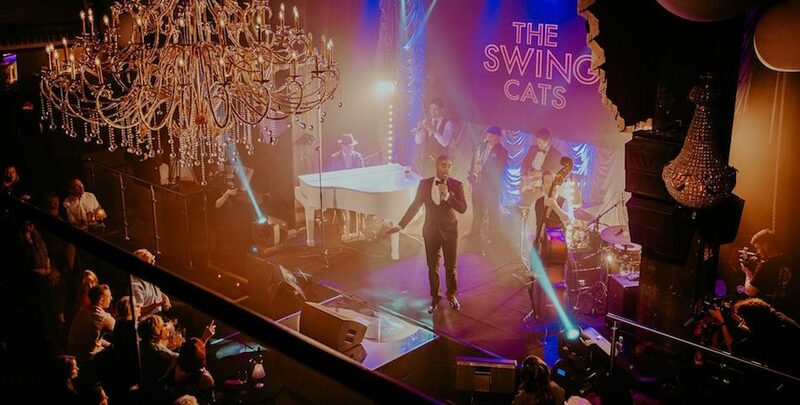 The Swing Cats are the best in the business so get in touch for your upcoming event or wedding in Ireland. I’d say most of you know about the Taste of Dublin. Its a great event for food lovers all over Dublin. And….. The Swing Cats will be performing at it!!. Needless to say we are very excited about this. Absolutely unbelievable experience filming our first CONCERT SPECIAL yesterday in Twenty Two Dublin!! To our special guests – The legendary PHIL COULTER – Showband King PADDY COLE – Al Foran – Gemma Sugrue… THANK YOU!! Thanks to all that came out to the show! The Swing Cats performed at the lovely venue Clontarf Castle House. Happy Mothers Day to all the amazing mammys out there from all of us!. Come to our next public showcase!. Have a bit of craic with us!. So we were so honored to be able to perform at the Gossies 2018 back on the 23rd February 2018. We had a great time doing what we love in a room full of influential and successful people. Don’t forget about The Swing Cats next public showcase!.